Fucoidan had a surprising health power! Do not you feel slimy when you touch seaweed such as kelp, wakame, mozuku or eat it? Fucoidan is a kind of sulfated polysaccharide contained in that "slimy" ingredient. When polysaccharides are mentioned, Mucopolysaccharide contained in Aloe and Beta Glucan contained in Agaricus are well known. Also, at the time of the ebb tide, seaweed will be bathed directly in the sun and dried. In such a case too, the "slimy" ingredient becomes a protective film and protects from drying. In other words, Fucoidan is a barrier that seaweed protects himself from external stimuli such as tidal current and ultraviolet rays, and prevents drying and bacteria. It is becoming known that the ingredients contained in this "slimy" act as amazing health power for us as well. 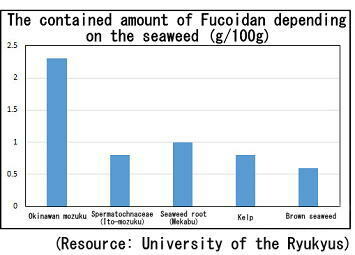 Well, the amount of fucoidan that is included in each type also differs among seaweeds like kelp and mozuku that are similarly twisting and swaying. ↑As you can see from the graph above, Mekabu and kelp are greatly excited, Okinawa Mosuku is No. 1. There is a proper reason for this. It is because Okinawa Mozuku lives in a shallow sea than Mekabu or kelp. In the sea, at the time of the ebb tide, Okinawa Mozuku will directly bask in the sun's rays and dries. As mentioned earlier that it is Fucoidan's role to protect it from drying. So, Okinawa Mozuku living in a shallow ocean contains more fucoidan than other seaweeds such as Brown seaweed and kelp to protect itself. We recommend Okinawa Mozuku as a raw material for products with superior refining technology.